The Shijiahe 石家河site is located in the Tucheng 土城village, which is in the northwest of Shihe Town 石河镇, Tianmen 天门, Hubei. It is where the Shijiahe ancient walled settlement, the largest walled settlement in prehistory in the middle reaches of Yangzi River so far, used to be located. Because the presence of settlement walls in the lower area at the southeast of the Shijiahe ancient walled settlement has been in suspense, the Hubei Provincial institute of Cultural Relics and Archaeology and the School of Archaeology and Museology, Peking University, did a small-scale excavation at the Shijiahe site during the March and April, 2011, in order to answer this question, comprehend the change of the climate and the environment in this area during 6,000BP to 4000BP, and supply more details for protecting the Shijiahe site. Also this excavation, which covers 200 square meters and a series of important achievements and discoveries were obtained. Confirming the presence of the settlement walls in the southeast of the Shijiahe ancient walled settlement and its relative chronology. Six squares, each of which is 5x5m, were laid out in south-north direction (labeled ⅠT1608~ⅠT1613) at the site. This excavation revealed that the deposit layers of the settlement walls here were located at 0.5-1.2 meters underground, and the remaining layers were 30-35 meters wide and over 1.5 meters thick. The layers of the settlement walls can be divided into seven layers and inclined from north to south. Based on the characteristics of these ruins and the exploring results from the lower area of the southeast of the Shijiahe ancient walled settlement, the west part of the settlement walls here were southwest-northeast orientated and connected to the south settlement walls of the Sanfangwan 三房湾site, while its east settlement walls connected to the east settlement walls of the Huangjinling 黄金岭site through the south of the Xushuling 蓄树岭site. So, the outline of the settlement walls of the Shijiahe walled settlement was basically confirmed, except for the northeast settlement walls, which was destroyed by the Tucheng site. In addition, the deposit layers of the southeast settlement walls of the Shijiahe walled settlement and the unearthed artefacts there supplied important criteria for precisely dating the construction and abandon of the walled settlement. According to the clay potteries from the layer 2 of settlement walls ⑥, which are gaolingguan 高领罐 pots with high neck, shuangfudou 双腹豆 plates with double bellies, wan 碗bowls, hu壶kettles, juanyanpen卷 沿盆basins with curling lip, etc., the construction of this walled settlement should not be earlier than the late period of the Qujialing屈家岭 Culture, because the clay potteries have the characteristics of those dating to the late period of the Qujialing Culture. While, the deposit above the ruins of the settlement walls could be divided into 12 layers and inclined from north to south. Also the ash ditches, ash pits, ash layers, tombs were found among the layers. These cultural layers and artefacts all were dated to the late period of the Shijiahe Culture, so it could be concluded that the settlement walls had been abandoned at the latest during the late period of the Shijiahe Culture. This conclusion is basically the same as the relative chronology concluded from the excavation of the settlement walls at Dengjiawan邓家湾, the northwest part of the Shijiahe walled settlement, in 1992. 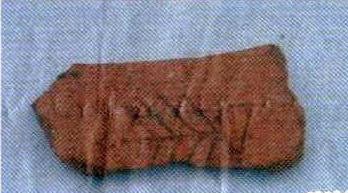 These confirm the chronology of the construction and discard of the Shijiahe walled settlement. The wooden remains were located at 3.35-3.63 meters underground in the northwest of IT1610 and southwest part of IT1611 and destroyed by the wall layer⑥. The wooden remains include two rows with 11 wooden pillars in all, which were in east-west direction. There were 6 pillars in the north row and three of them were square shape, three of them are round shape; while there were 5 pillars in the south row and one of them was square shape and four of them were round shape. The diameters of the wooden pillars were generally between 0.04-0.11 meters. Based on the analysis to the cultural layers, an ancient watercourse may have existed here in south-north direction before the construction of the settlement walls. 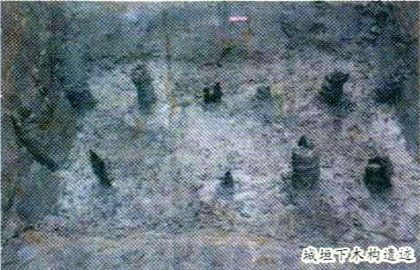 Moreover, the wooden remains happened to be laid cross the ancient watercourse, therefore, they may have been an ancient bridge connecting the Sanfangwan site and the Xushuling site. Considering that the settlement walls were not constructed earlier than the late period of the Qujialing Culture, the chronology of the wooden remains was not later than the Qujialing Culture. 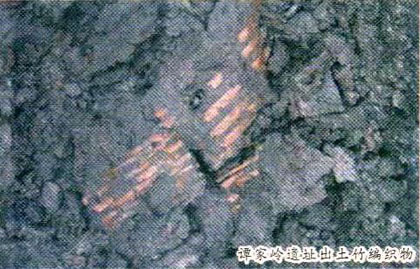 The excavation at the south of the Tanjialing 谭家岭site, close to the lower area of the Sanfangwan site, showed that the deposit here can be divided into 9 layers. Among of them, the artefacts from Layer 3-6 mainly are clay potteries, and most of the patterns are crisscrossed basket texture, and some square texture, vein texture, additional heap pattern, etc. The main pottery types are quanzupan 圈足盘ringed-foot plates, ding鼎 tripods, zheyanguan折沿罐pots with folding lip, gaolingguan 高领罐pots with high neck, pen盆basins, dou 豆plates, xiefubei斜腹杯cups with oblique belly, weng 瓮urns, leibo擂钵bottles, gui鬶tripods, etc. These potteries can be dated into the late period of the Shijiahe Culture; among the artefacts from Layer 7-8, the potteries mainly include quanxingding罐形鼎tripods in a jar shape, zheyanguan pots with folding lip, gaolingguan pots with high neck, dou豆plates, xiebubei cups with oblique belly, bo钵bottles, wan碗bowls, pen盆basins, gang缸urns, etc. The stone tools from Layer 7-8 include axe, adze, knife, etc., dating to the early and middle period of the Shijiahe Culture；Layer9 was black mud deposit, which was over 1.2 meters thick. The artefacts unearthed from this layer were polished black fine clay potteries and quantities of organic matters, such as logs, square timbers, planks, wooded navicular apparatus, bamboo fabric, complete leaves, reed leaves, field snail etc. Based on the characteristics of the mud deposit, an ancient east-west orientated watercourse may have existed between the Tanjialing谭家岭 site and the Sanfangwan site，dating to the Shijiahe Culture. This ancient watercourse was partly covered by the deposit of the Tanjialing Culture, so the organic matters could be preserved well for a long time in a saturated water and isolated air condition. In addition, a pair of wooden structure remains was exposed from the mud. This remains was in northwest-southeast direction and could be divided into three rows. The middle row composed of 11 logs which vertically inserted into the mud. However, only one log was found in the south row and only one square timber and two logs were discovered in the north row. Due to the limitation of the excavation area, the wooden remains need to be further studied. Moreover, some materials related to the environment information are being studied too. Besides the quantities of artefacts dating to the Qujialing Culture and the Shijiahe Culture, some inscribed symbols and new pottery types were newly found, further enriching the connotation of the Qujialing Culture.